If you are just beginning to learn how to drive a car and want to read about some of the basics that you need to consider while driving or just want a few driving tips, then you have come to the right place. When one is learning how to drive, there are a lot of things that need to be kept in mind. In fact, whether a rookie or a mature driver, it is very important to be really careful when you are behind the steering wheel. The first thing that you should do before you start driving is to get comfortable with your car. Get familiar with the basics of the car in theory before you practically start driving it. Learn what a clutch does, understand the gear arrangements and learn facts like one should never shift to a lower gear at a higher speed and that it’s always better to let the car come to a stop before you engage the reverse gear. The right seating position is crucial; even experienced drivers don’t position themselves correctly and thus lack comfort and control, which increases the probability of accidents. Ensure that you sit straight with your back and buttocks cupped in the seat fully and are at an angular position thus helping to prevent back injuries. The seat should be set in a position where you can see all around, very easily and comfortably. It is usually said that the height of the seat should be such that your eyes are at half the height of the windshield. The seat should longitudinally be at a position where your knees are not stretched too much when you apply the accelerator, brake, and clutch pedals of the car. Push the brake fully with your right foot and depress the clutch, this should be done in a manner such that while depressing the pedals fully, your knees stay bent at about 120 degrees. Sit upright and don’t stoop forward. Once you are in the driver’s seat, be attentive, adjust the mirrors, wear your seatbelt and keep the rules of the road in mind. Avoid distractions while you are driving because nowadays the roads are jam packed and therefore you need to keep your eyes and attention focused towards it for every single second. Two most common and basic rules before you start driving; don’t use a mobile phone while driving and don’t drink and drive. Along with these rules, new drivers especially should avoid eating, turning up the music to a very high volume and indulging in deep conversations. 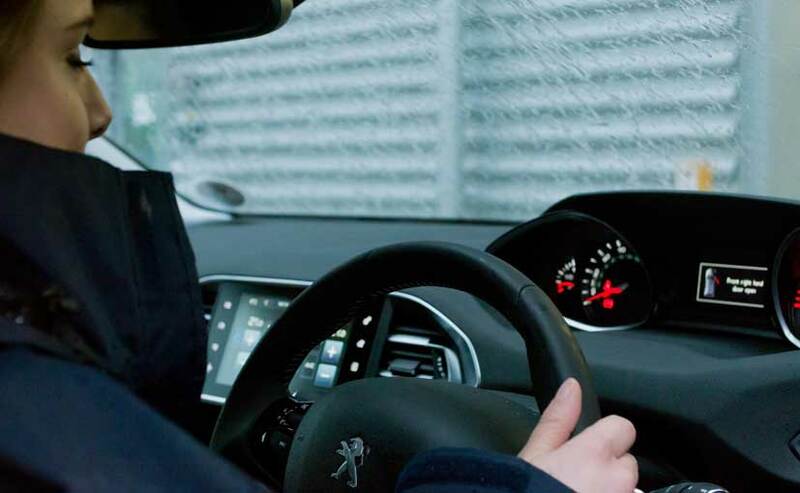 Though there is no one correct way of holding a steering wheel, the correctness depends on how you want to hold it to be able to have maximum control over the wheel. Most researches show that the ‘9 o’clock and 3 o’clock’ position is the best. It’s very important to hold your steering wheel correctly to have the best control of the steering and, in turn, the car. Understand the importance of turn signals or indicators. Once you are on the road, you are one among many and therefore, it is very important that you alert the vehicles around you when you are about to turn. Using signals helps save a lot of mishaps on the road. The most common temptation, when one is driving a car, is to speed up. It is very important that you first get familiar with the car before you start speeding. One should always maintain a decent distance from the vehicle that is moving in front. You might be a very safe driver and follow all the rules and regulations but that doesn’t mean that the others are too. The best way to drive safely is to be a defensive driver rather than an aggressive driver. Horns are to alert the drivers around you, not to take out your frustration. Excessive usage of horns can irritate fellow motorists and can sometimes lead to road rage.